olemeta is a script to parse OLE files such as MS Office documents (e.g. Word, Excel), to extract all standard properties present in the OLE file. It is part of the python-oletools package. oletimes is a script to parse OLE files such as MS Office documents (e.g. 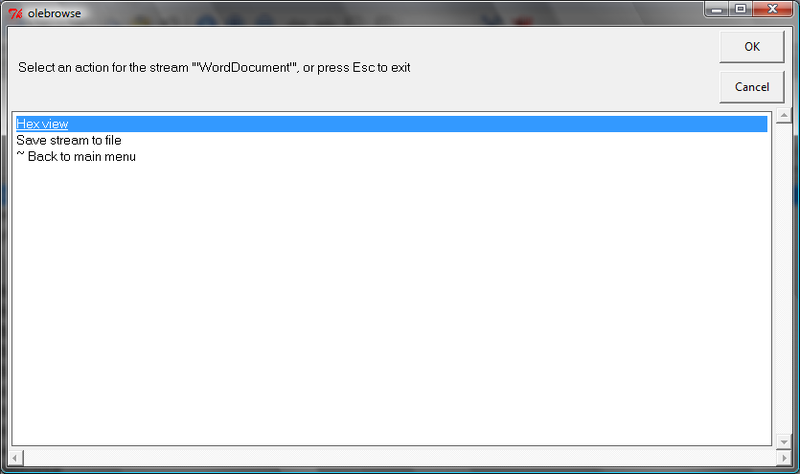 Word, Excel), to extract creation and modification times of all streams and storages in the OLE file. It is part of the python-oletools package. olevba is a script to parse OLE and OpenXML files such as MS Office documents (e.g. Word, Excel), to detect VBA Macros, extract their source code in clear text, decode malware obfuscation (Hex/Base64/StrReverse/Dridex) and detect security-related patterns such as auto-executable macros, suspicious VBA keywords used by malware, and potential IOCs (IP addresses, URLs, executable filenames, etc). It is part of the python-oletools package. olevba is based on source code from officeparser by John William Davison, with significant modifications. MS Office files encrypted with a password are also supported, because VBA macro code is never encrypted, only the content of the document. See this article for more information and technical details about VBA Macros and how they are stored in MS Office documents. See the oletools page for more info. see changelog in source code for more info. The oletools package is available on the project page. If you provide a file it will be opened, else a dialog will allow you to browse folders to open a file. 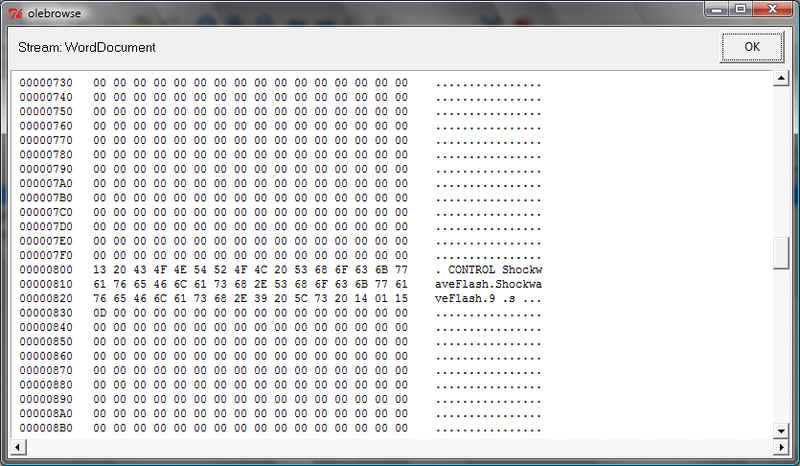 Then if it is a valid OLE file, the list of data streams will be displayed. You can select a stream, and then either view its content in a builtin hexadecimal viewer, or save it to a file for further analysis. It can also extract Flash objects from RTF documents, by parsing embedded objects encoded in hexadecimal format (-f option). 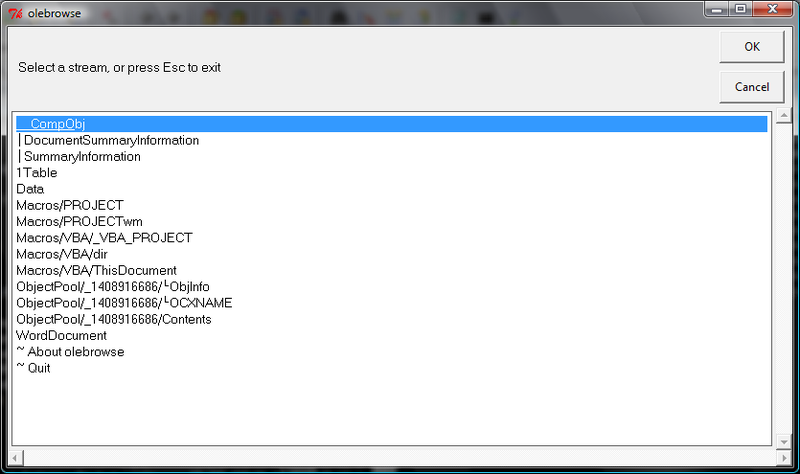 For this, simply add the -o option to work on OLE streams rather than raw files, or the -f option to work on RTF files. See also the article How to Extract Flash Objects From Malicious MS Office Documents, which shows how to use xxxswf.py in practice. You may simply use "pyxswf.py -o" instead of xxxswf.py. It extracts and decodes all the data blocks encoded as hexadecimal in the RTF document, and saves them as files named "object_xxxx.bin", xxxx being the location of the object in the RTF file.